Can you imagine a person risking his house and all his belongings for raising an academy to develop players and build their career? After a decent career and fair amount of success, a player would definitely love to sit back and enjoy rest of his life happily. This is not the same in case of Pullela Gopichand, only the second player to win the prestigious All England Badminton Championships which is equivalent to Wimbledon in tennis. He has inspired many generations by his performance on and off the court. Read More – Pace ? Thrill ? Badminton !! Like every Indian, his first preference was cricket but his brother encouraged him to take up badminton and see, what a great legend we have today! During his college days, Gopichand was brilliant player and also captained Indian combined universities badminton team in 1990 and 1991. Gopichand was coached by S. M. Arif before Prakash Padukone accepted him at Prakash Padukone academy. He also trained under Ganguly Prasad at the SAI Bangalore. Prakash Padukone won the prestigious All England Badminton Championships in 1980 which also proved to be an inspiration for Gopichand. Getting the lessons of badminton from a player like Prakash Padukone was an important aspect in Gopichand’s life. 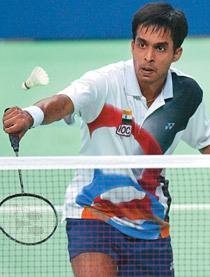 Gopichand won his first National Badminton Championship title in 1996, and went on to win the title five times in a row, until 2000. He won two gold and one silver at the Indian national games, 1998 held at Imphal. In 2001, he won the prestigious All England Open Badminton Championships at Birmingham. He defeated then world number one Peter Gade in the semi-finals before defeating Chen Hong of China to lift the trophy. Injuries are what halted Gopichand’s career somehow. During the nationals in 1994 in Pune, he collided with his partner while playing doubles and had to undergo an operation for a ligament rupture at a hospital in Delhi which kept him away from the game for six months. In 1997 he had to stop the game for another 2 months due to injury. Career wins and trophies are secondary things which inspire me and many others, contribution to Indian Badminton and his sacrifices remain first. He mortgaged his own house for constructing world class badminton courts and making necessary facilities available. Due to his injuries he was forced to control his career. At the age of 27 and with very few career years left, he decided to set up world class facilities to upcoming players. He struggled a lot to find financial help and luckily Nimmagadda Prasad; a renowned industrialist donated ₹50 Million to Gopichand for constructing his dream academy. Gopichand had the entire plan set up in his mind and used the 5 acre landed which was awarded to him by the Andhra Pradesh Government in 2003 for the heroics in All England Badminton Championships. Finally in 2008 the academy was ready and then the quest for the best began. 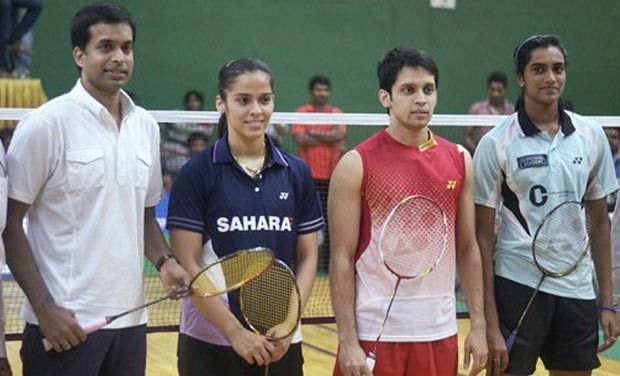 Badminton stars like P Kashyap, Saina Nehwal, HS Prannoy, Sai Praneeth, PV Sindhu. Kidambi Srikanth and many others train at the Pullela Gopichand Academy in Hyderabad. The success in 2012 and 2016 Olympics for Saina Nehwal and PV Sindhu are the results of the extreme hard work of the players and most importantly the guidelines and training from the coach, Gopichand. He is also the coach of Indian National Badminton Team and the players represent India on foriegn tours under his guidence. At 4.30am every day, Gopichand is present at the training area which displays his dedication and passion towards this game. When interviewed, the players training at the Gopichand Academy say that Gopi Sir works harder than the players and is always ready to guide them with anything about the game or apart from that. He is awarded with the Arjuna Award, Rajiv Gandhi Khel Ratna Award, Padma Shri, Padma Bhushan and also the Dronacharya Award, which is given to coaches in sports add to his marvellous profile. There are very few people who strive for the success of other people and make sure that their efforts help someone else find their perfect life and career. Gopichand is one such example and who knows, all the next Olympics badminton medalist will be from his academy! Very nicely written. Appropriate information in an effectivel way. Keep going!